Professor Ludmil Christov is Chair of the Department of Cinema, Advertising and Show Business at New Bulgarian University. In 1984, he received an MA in Film and TV Cinematography from the Krustio Sarafov Higher Institute of Theatrical Art. He worked at Boyana Film Studios from 1973 to 1990. 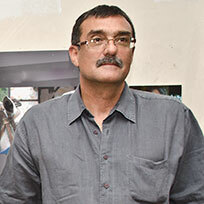 Associate Professor of Film and Television Cinematography at NBU from 1999 to 2007, Professor since 2007. Professor Christov is also a freelance film and television cameraman. He has shot documentaries, commercials, popular science and feature films, as well as serials and TV programs. Professor Ludmil Christov has been teaching at NBU since 1991 and has been a member of the Academic Council since its establishment. In 1993 he founded the Department of Cinema and Video which, in 1994, became the Department of Cinema, Advertising and Show Business. Chair of the Department of Cinema, Advertising and Show Business in 1994-2000 and since 2006 to date. He is the author of the one-year Advertising Agent and Sales Traveller Program (1994) and of Cinema and Television Program (1993). He headed the team that prepared the joined program in Visual Arts (2007). Director of the BA Program in Film and Television Arts and of the NBU Film Center between 2000 and 2007. Professor Christov organizes and participates in conferences in the sphere of higher education, film and television arts and advertising communications. He was the chair of the Council of Directors of Sofia Film EAD between 1997 and 2002. He has been frequently a member of juries and casting committees at cinema and television festivals. His films have been awarded national and international prizes. Professor Christov is a member of the Union of Film Producers, the Union of Bulgarian Journalists, the permanent Committee for Liberal Arts at the National Evaluation and Accreditation Agency, the chair of the council board of “Film-author” and a co-founder of the Association of Academically Ranked lecturers in the field of cinema “Academica 21” (2003). His scientific interests are in the sphere of higher education, cinema and television, photography and arts.